While it may not be apparent at first, the day-to-day workflow for a logistics company involves a series of business critical tasks. These include freight handling & invoice generation, route optimisations, tracking/tracing, obtaining proofs-of-delivery (PODs), and managing other related issues. A combination of manual inefficiencies and persistence with outdated methods & machinery often lead to resource-wastage, rising costs, and – as a result – losses. Dusk Mobile brings to you digital solutions to make your transportation business more effective, efficient and rewarding. Manual processes, which are time-consuming and error-prone. High response times and lack of transparency. Overcapacity and/or underutilisation of resources. Problems due to outdated legacy systems & siloed IT departments. Delays in cash-collection and billing. Lack of flexibility and contingency plans. Team Dusk provides you with customised digital solutions that can serve as game-changers for your business. With real-time cost management, process automations and delivery validations, we help you stay ahead of the competition. At Dusk Mobile, we are committed to provide you with streamlined, end-to-end digital solutions and DevOps services – ideally suited for your business requirements. Right from commercial and strategic tasks, to key operational processes – our solutions help your logistics business at every step. We focus on making transportation & logistics more data-driven than ever. In-depth analytics are used to plan optimised load shipments, routes & navigation, pricing, and other processes. Predictive maintenance is also facilitated. Given the labour-intensive nature of a number of tasks in this industry, process automation can give a significant boost to efficiencies. From procurement and control, to supply chain improvements and quality maintenance – everything can be improved considerably. Full implementation of a DevOps culture is critical for breaking down the silos across the different IT departments. With DevOps, information about things like shipping and inventories become more easily available. Our digitisation modules play a big role in ensuring that vehicle fleets are used in the best possible manner. With technologies like smart navigation and route optimisation, total operating costs can be reduced. To stay successful and sustainable, a logistics company has to constantly provide the best customer experiences. With our solutions, you can do just that – by understanding the precise client requirements and delivering accordingly. Our innovative practices are geared to ensure long-run stability of your business. AI, robotics and elements of augmented reality are embedded – on a case-by-case basis – to make transportation & logistics more agile. 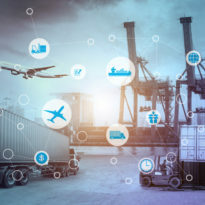 Transportation & logistics has been late to enter the digitisation game (compared to, say, fintech or retail) – but things have picked up over the last few quarters. To emerge successful in this growingly competitive industry, our digital platforms and solutions will be really handy, for optimising resource usage, ruling out overcapacity, easing the supply chain, enhancing visibility/communication and matching demand & supply levels. Team Dusk can unlock the recipe for business acceleration for your enterprise. Call us for a FREE demo right now: +61(0) 3 9071 0333.